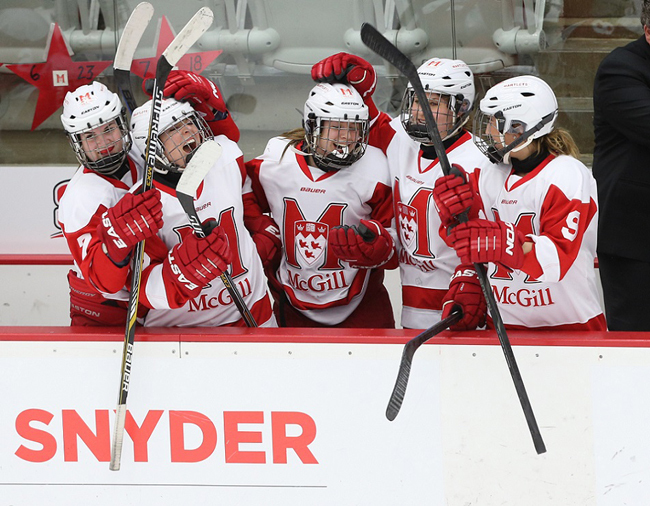 Gabrielle Davidson of Pointe Claire Que., scored on a power-play with 49 seconds remaining and Taylor Hough, a junior from Toronto, earned her first career shutout as the top-ranked McGill women's hockey team skated to a 1-0 victory over No. 4 St. Francis Xavier in a nail-biting semifinal at the CIS Final Eight national championship tournament yesterday in Calgary. Gabrielle Davidson of Pointe Claire Que., scored on a power-play with 49 seconds remaining and Taylor Hough, a junior from Toronto, earned her first career shutout as the top-ranked McGill women’s hockey team skated to a 1-0 victory over No. 4 St. Francis Xavier in a nail-biting semifinal at the CIS Final Eight national championship tournament at the Markin MacPhail Centre, Saturday. The Martlets will make an eighth appearance in the national championship final, against second-seeded Western, which advanced after surprising the Montreal Carabins 2-0, on today (Sunday) at 8 p.m. (Eastern) in a game that will be both televised and streamed live on Sportsnet One and Sportsnet 360. McGill, which has only played Western once in school history – a 3-0 home-ice victory on Dec. 28, 2013 – will add to their CIS record dozen medals at the tourney, including four gold, three silver and five bronze. Only Alberta has won more national titles with seven. McGill dominated from start to finish, outshooting the X-Women 37-12 but the game remained scoreless until the final minute, thanks largely to StFX goaltender Sojung Shin , a sophomore from Seoul, Korea, who was credited with 36 saves and was selected as player of the game for the X-Women. An unofficial shot count by McGill officials had the tally at 51-13. Melodie Daoust of Valleyfield, Que., initiated the winning marker, collecting the puck along the boards and circling around the offensive zone before firing a pass towards the net that was redirected by the left skate of McGill defenceman Brittney Fouracres, a native Calgarian who was positioned in the slot. Leslie Oles, a fifth-year senior from Beaconsfield, Que., then took a shot from in close and Davidson, a management junior, pounced on a juicy rebound to stuff it in past the sprawling netminder. The shutout was McGill’s 13th in 45 lifetime games at the national championship tourney but the first-ever in 52 career contests for Hough, a 5-foot-10 industrial relations major who turned down a number of NCAA scholarship offers to play at McGill, where she has posted a perfect 5-0 record in two trips to the Nationals. “Better late than never, I had a bit of a monkey on my back but I thought that I would save it for a 1-0 game,” joked Hough, who was forced to make a handful of key saves and has a long hockey lineage in her genes. Although she was born in Toronto, her father’s side of the family has Montreal hockey roots going back the early beginnings of the game in the late 1800s. Her great, great grandfather (Albert Henry Hough) played with the famous Montreal Winged Wheelers, alongside the legendary James Norris who eventually bought the NHL’s Detroit franchise and “borrowed” the old Winged Wheelers logo to create the Red Wings logo. McGill was 1-for-5 on the power-play, while StFX was 0-for-1. * The webcast of the finals are on pay-per-view basis.